Photo for the Mirror by J.D. Cavrich P-O’s Kam Harris gets a hug from a coach after the team’s victory. LORETTO — Philipsburg-Osceola junior pitcher Kam Harris seemed calm, cool and collected when Central batters reached base on Wednesday evening in the District 6 Class 3A championship. She had a lot of opportunities at keeping her cool because the Lady Scarlet Dragons stroked 10 hits, had 15 total runners, including 10 in scoring position, stole six bases and put pressure on Harris and the P-O defense all night. But every time the Lady Dragons pressured her as a fierce wind blew and a late rain belted Saint Francis’ Red Flash Field, Harris performed a Houdini act to escape trouble. She stranded 13 Central runners with timely pitches, and her strikeout of Tori Longenecker for the final out sealed a 3-2 P-O win. It was P-O’s third straight District 6 title and 13th overall. What a nice birthday present for Gonder, who turned 62 on Wednesday and serenaded with the birthday song afterward. While the Lady Mounties were receiving their individual trophies and the captains were hoisting the team trophy, the Lady Dragons could only wonder what would have happened if they could have taken advantage of all of those opportunities. Both teams will play first-round state playoff games on Monday at sites and times to be announced. P-O (21-1) knows it will play District 3 runner-up Delone Catholic. Central (14-9) will take on the District 7 champion, which will be determined today between South Park and Southmoreland. Just as Harris seemed comfortable with runners on base, the Lady Mounties seem comfy in playing one-run games. 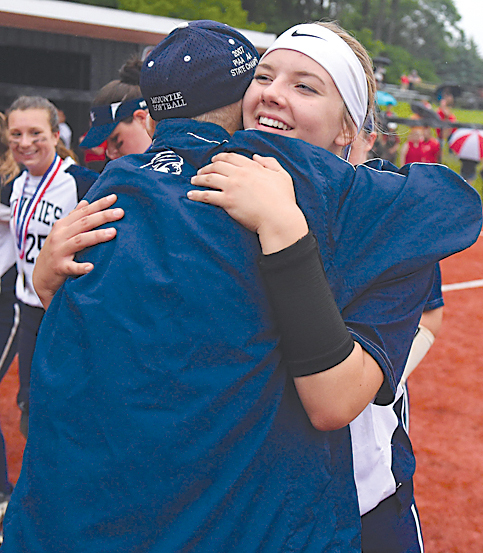 They earned three one-run playoff wins for probably the first time in the storied history of the program, beating Tyrone, 7-6, and Ligonier Valley, 1-0, to get to the finals. Harris started her escape act in the first inning as the Lady Dragons loaded the bases, but she got a strikeout to end the threat. Harris walked six batters, but five of them were intentionally. Central’s stars, leadoff hitter Olivia Smith and No. 5 hitter Cam Feathers, were walked a combined five times, including four times intentionally. Harris received defensive support in the top of the third when Ashley Negley stole second, and she tried to make it to third on an errant throw by catcher Kylie Thal, but right fielder Madison Lucas threw her out at third. Central pitcher Dylan Claycomb, who gave up seven hits, gave up a run in the third inning when Kendra Carns scored on a Hannah Thompson one-out ground ball. The Lady Mounties got two insurance runs in the fifth when No. 9 hitter Lacey Potter, who went 3-for-3, scored on a Lucas sacrifice fly. Thal scored on the same play on the errant throw from right field. Central left two runners on base in the second, fourth, fifth and sixth innings. The Lady Dragons finally dented Harris’ armor in a rainy seventh as Negley led off with a single and Claycomb slammed a two-run home run over the center field fence. Cass Mock followed with a single to center, but Harris induced a fly ball out and the strikeout to end the game. Central (2): Smith 2b 100, Baker 1b 301, Heuston pr 100, Ritchey ss 402, Negley rf 412, Feathers c 100, Padula cr 000, Claycomb p 411, Mock lf 402, Metzler cf 401, Longenecker 3b 401. Totals: 30-2-10. Philipsburg-Osceola (3): Thal c 311, Thompson ss 200, Lucas rf 200, Harris dp-p 200, McDonald cr 000, Burge 3b 301, Adams lf 201, Simpson 2b 300, Carns cf 311, Potter 1b 303, Minarchick pr 010, Taylor p-2b 000. Totals: 23-3-7-2. Errors–Negley, Longenecker; Thal, Lucas. 2B–Metzler, Potter. HR–Claycomb. RBI–Claycomb 2, Thompson, Lucas. SAC–Thal. SF–Lucas. SB–Smith 2, Negley 2, Feathers, Mock; McDonald. LOB–Central 13, Philipsburg-Osceola 7. Central: Claycomb (L)–6 IP, 7 H, 3 R, 2 ER, 3 BB, 2 SO. Philipsburg-Osceola: Harris (W)–7 IP, 10 H, 2 R, 2 ER, 6 BB, 5 SO. Records: Central (14-9), Philipsburg-Osceola (21-1).